Mix the ice cream and fruit mince, then return to the freezer. Preheat the oven to 150°C. Beat the egg whites at a high speed using an electric hand-mixer until soft peaks form. Slowly add the sugar while beating at a medium speed until thick and glossy. Add the food colouring until the mixture is light pink. Spoon the mixture onto a greased baking tray or baking mat into circles 6 cm in diameter. Bake for 35–40 minutes, or until crisp on the outside and slightly chewy inside. Allow to cool. 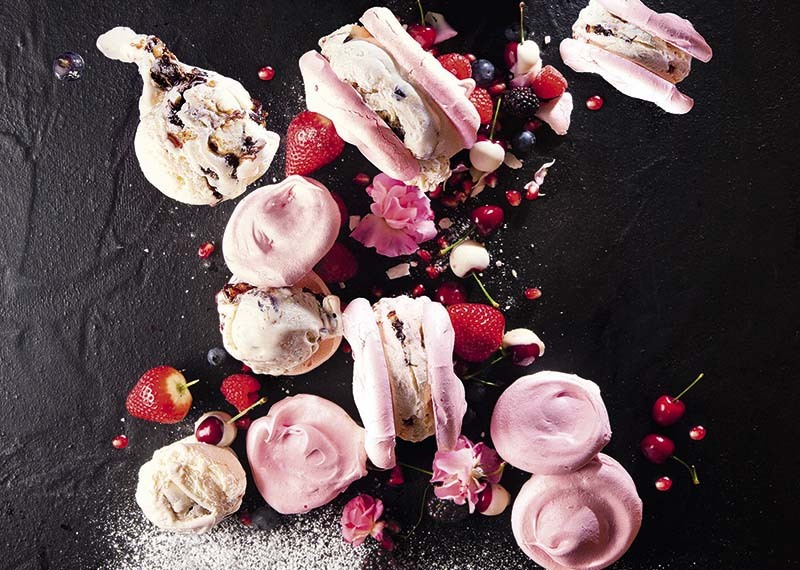 Sandwich the ice-cream between the meringues and place on a platter. Garnish with berries and dust with icing sugar.